A wonderful friend of mine in Todos Santos came by my studio one day and purchased one of my favourite paintings. The one of my studio called Purple Door Studio. She also purchased a slightly older painting called Flower Pot and commissioned me to do this one. 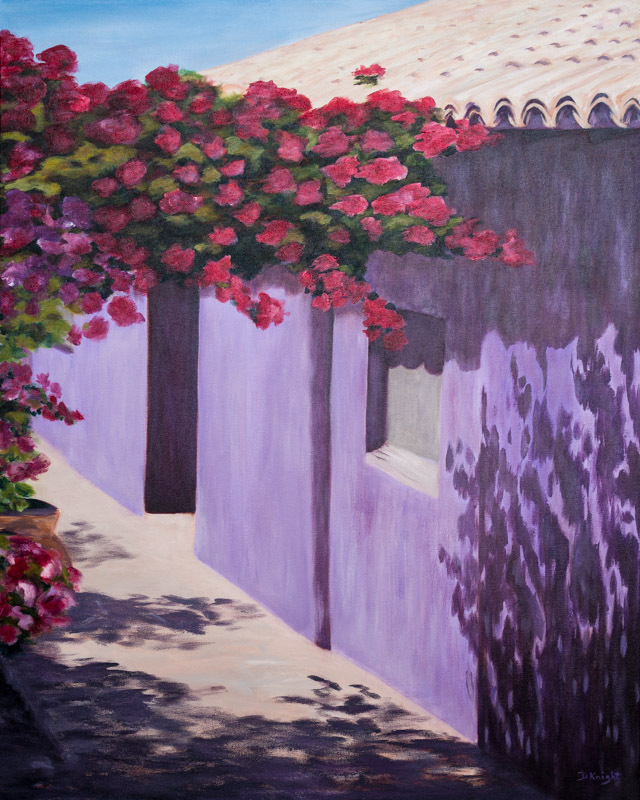 I haven’t painted buildings, doors & bougainvillea for awhile so it brought me back to a previous style and technique. I just may have to go back to this once I’ve finished my ‘Series’ as I had so much fun. Loved the colours, the bougainvillea dancing on the wall, the shadows and the flower pot. Ohhh, I like painting flower pots!! The painting is untitled as I thought I should let the new owner name it. It wouldn’t exist without her!! I LOVED the Purple Door Studio painting. I can’t believe you sold it!! This one is lovely as well. Hope all is well. Have moved back to Calgary now and am currently on business in Europe. Life is good.